In my early childhood, my parents were told that I had dyslexia and dyscalculia. They were told that with this drawback, I would never achieve anything constructive in my life. My parents were a little shocked as they had no clue what was dyslexia and dyscalculia and how to handle the situation. They never gave up on me and believe that I could reach great success in life. They found a tutor for me who was able to train me to do better and gave me the same treatment as other students. As a student suffering from dyslexia and dyscalculia, I had an option to skip Maths and opt for an additional subject in in 8th grade. Computer as an additional subject was introduced to me. It was the first time I was introduced to the world of internet. I started researching what internet has to offer and how it works. Those days email and website were all new and fascinating. My father bought our first desktop so I can do my research at home. My father wanted to turn my love for the computer into something more constructive to help me in my future. After 12th standard, my father enrolled me in a short computer course from NIIT to develop new skills and polish my old skills. Once the course was over, my teacher was so impressed with my performance that she advised my father to enroll me in a 3 years Software Development course. This course was carried out in parallel with my regular college. I would become both a graduate and a software developer at the same time. My father happily enrolled me. During the 3 year period, I learned different languages like C Sharp, C, C++, Java, and dotNet. After I completed my graduation and NIIT course, I was confused which field to select and apply for a job. There was a rule in NIIT, I had to complete 1 year of internship after my course. If due to any circumstance I could not complete, I would not get the certificate. My parents had spent a lot of money on my course and I didn’t want their hard earned money to go down the drain so I started going for different interviews in the IT field. My father had advised me that if after one year I was not happy with my IT job, I can quit and pursue Banking career. In 2009 on my birthday to my surprise and good fortune, I passed an interview and joined a company. On the first day, I was introduced to WordPress. I got an assignment to change the look and feel of WordPress dashboard. This assignment had to be completed within the next 6 hours. I had no clue what WordPress was. I was looking at the whiteboard in front of me and thinking this assignment is not possible to complete within 6 hours. I thought my boss was joking (Bosses generally joke with interns). Guess who came to the rescue. GOOGLE. I started researching about WordPress on how it works and how to use it. After 2 hours, when I was comfortable using WordPress, I started searching how to change look and feel of WordPress Admin Dashboard. Thankfully, I found a plugin which can change the look and feel of the WordPress Dashboard. I learned how to install and work with it. After trying different combinations of color and style, I finally completed the assignment with 2 hours to spare. My boss was happy. Unfortunately after 4 days of working with WordPress, I was shifted to another CMS. I started working with the other CMS for so long that I completely forgot about WordPress. I worked with that particular CMS for 5 years. After 5 years, my office got an international project in WordPress. My boss told me to lead the project. I was hesitant since I had lost touch with WordPress. But I decided this is a great opportunity to become a team leader and lead from front. I decided to update my WordPress skills. Google GOD came to my rescue again. I updated my skills and also taught my junior team members all about WordPress. My juniors team members who never knew anything about WordPress, started to love and use WordPress frequently after my training. My team completed the project in 2 weeks. This project got me back in WordPress for good. As a team leader, one needs to help juniors to solve issues and guide them wherever necessary. I never always had the answer to their problems. I did not have any friends from the WordPress world who I can just talk to and discuss things. All my friends were either in dotNet OR commerce fields. For this reason, I was in look out for some kind group which would help me expand my scope of knowledge in WordPress. In 2015, when I was browsing Facebook, I came across an ad about WordCamp Mumbai. I missed out on the event by 2 days. Somehow I found the meetup website and joined the WordPress Mumbai meetup group. At the beginning, I didn’t have time and there wasn’t any topic that interested or motivated me to attend the meetup. It was either clashing with shopping or work or outing with friends or something or the other. Finally, after months I found one interesting topic, and in the comments section, they had mentioned that it will be a beginner level workshop. Finally I decided attend the meetup at any cost. I rescheduled all my plans so I ould attend the meetup. I remember I was on my way to the meetup and was talking to my best friend on phone. I was a bit nervous as I didn’t know anyone there. I could not find the place for the meetup. I told my friend that I am taking a U-turn and going home. BUT to my disadvantage, I finally found the venue and I decided to attend the meetup. In the first 15 mins of the meetup I realized that it’s not a beginners topics. Once the meetup ended, I got up from my seat and left immediately. I was unhappy with the way it was presented. After a few months, another great topic was announced in the meetup group. My heart told me to take a chance again. Thankfully this time I knew the venue (same as last time). I attend the meetup and was happy with the way it was presented and learnt a few important tips. After the meetup was over the speaker took time and spoke to individual attendees. When he come to me, I took the opportunity and asked a couple of issues I had with one of my project. He sweetly helped, guided and gave me a few tips on how to deal with my issues. The next day to my surprise I receive a message from the team leader Alexander Gounder. He asked me if I want to speak at a meetup. I politely declined the offer as I was not confident. After this, for a couple of the next meetup, I attended and got to know a few people. During that period, there were talks about WordCamp Mumbai 2016. 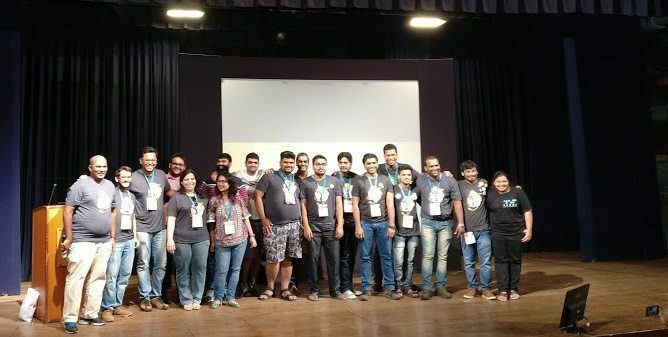 I showed an interest to be a part of the team who handles WordCamp Mumbai. I thought WordCamp was a conference where 100 or more people attend it. On the first day of WordCamp Mumbai, I was surprised to see so many WordCamp enthusiastic attending and enjoying this event. After seeing a successful WordCamp 2016, I try to attend as many meetups as possible. I started with an entry-level role with basic responsibilities in my first WordCamp 2016. Gradually I started taking an active part in volunteering taking over more responsibilities. In WordCamp 2017 I handled speaker profiles and social media promotions. 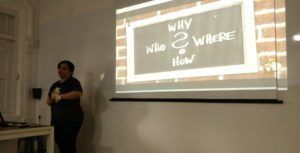 In WordCamp 2018, I am getting to know more about what all an organiser needs to do from planning to execution, to make the event the WordCamp an successful event. 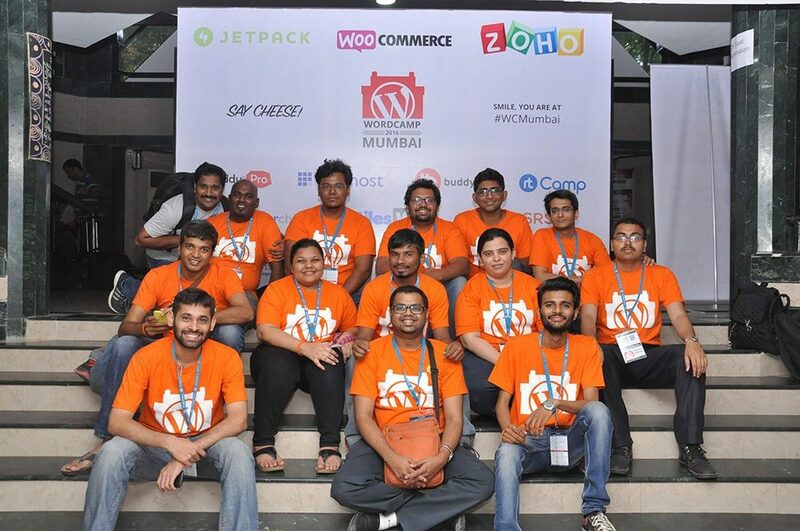 After spending 3 years with WordPress Mumbai Community, I am glad to be part of this amazing team. My WordPress journey over the last two years has been excellent, filled with beautiful surprises. I have been interviewed twice. Never in my wildest dreams did I ever thought that someone would interview me. My first ever interview was with Bridget and Jen for Community Connections by WPwatercooler. Second was with David Hayes for WPShout on WordPress Security. Introduced to Rosie pins – Wapuu for Women Who WordPress. 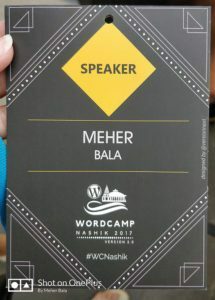 Travelled to different cities across India, just to attended wordcamps. Made many new friends locally and international. Conducted a meetup on “Contributing to WordPress”. Conducted a panel discussion at WC Nashik 2017. 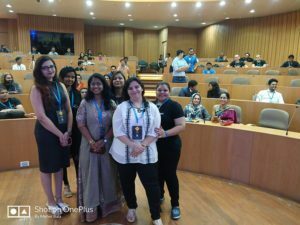 Running a FB group especially for Indian WordPress Women Community. Writing an article for HeroPress. Contributing my part in the Marketing Team WordPress . Apply as a speaker in at least one the WordCamp. Attend and volunteer at an International WordCamp. Attend and volunteer at WordCamp US 2018. One of my biggest dreams would be to lead WordCamp Mumbai as a lead organiser. My advice to all who earn their livelihood from WordPress is to try and give back to the WordPress community in any way possible. I am sure you will either learn something new or teach something new to someone else or just make new friendships. At the end of the article, I take the opportunity to thank my parents and my sister for always standing by me and believing me. I thank my teacher Ms. Amita, my boss Mr. Ivan Bayross, my WordPress friends, and my virtual international friends for always guiding and motivating me to stay focussed and to keep learning new things in life. A big thank you to Topher for giving me an opportunity to write about my life journey. Being dyslexic I still make mistakes and I know that I’m not perfect. But I know for sure there is no harm in making mistakes. You need to learn from them and grow your skills. Don’t let your disabilities get in the way of your success. If you are reading this article and can connect with my story, do let me know in the comment section. I would love to hear from you. 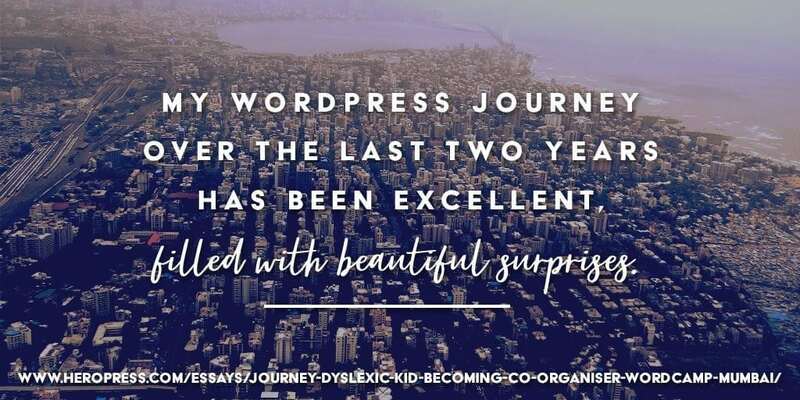 The post My Journey from being a Dyslexic kid to becoming A Co-organiser For WordCamp Mumbai appeared first on HeroPress.